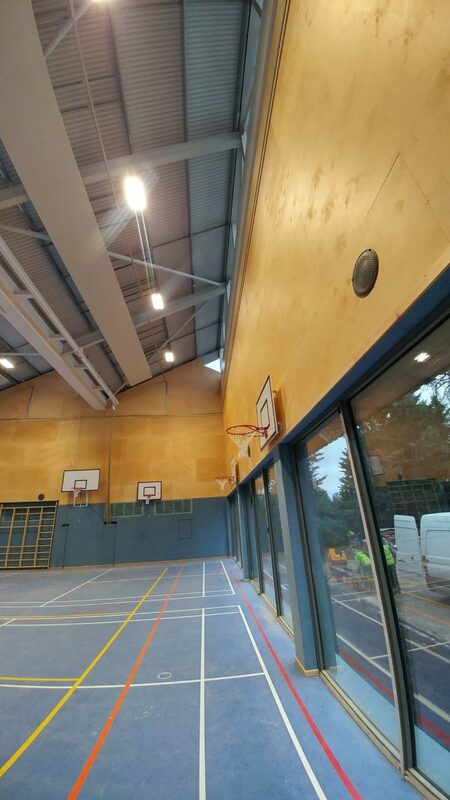 Our SFS works at The German School or Deutche schule London, is a project we’ve very nearly finished. 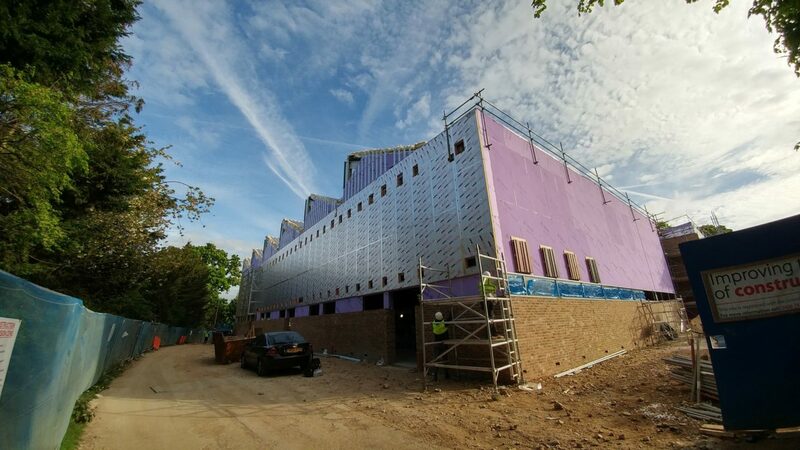 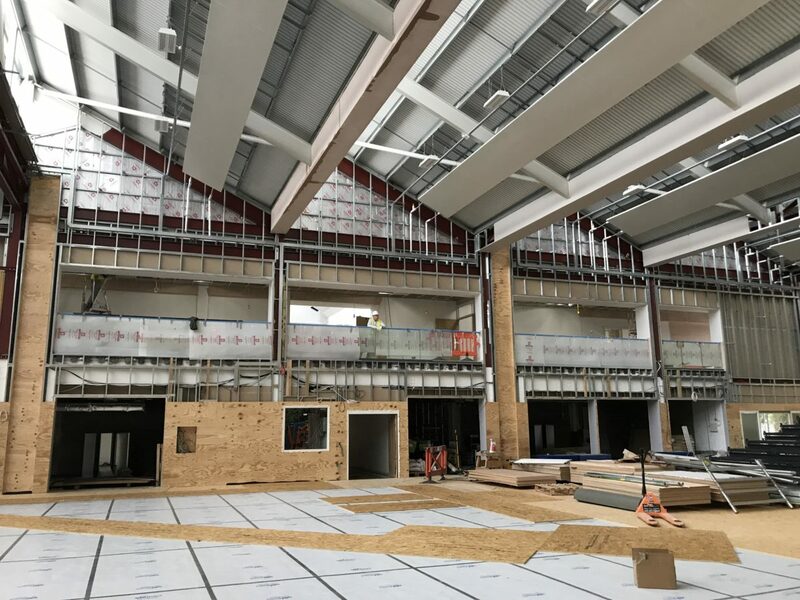 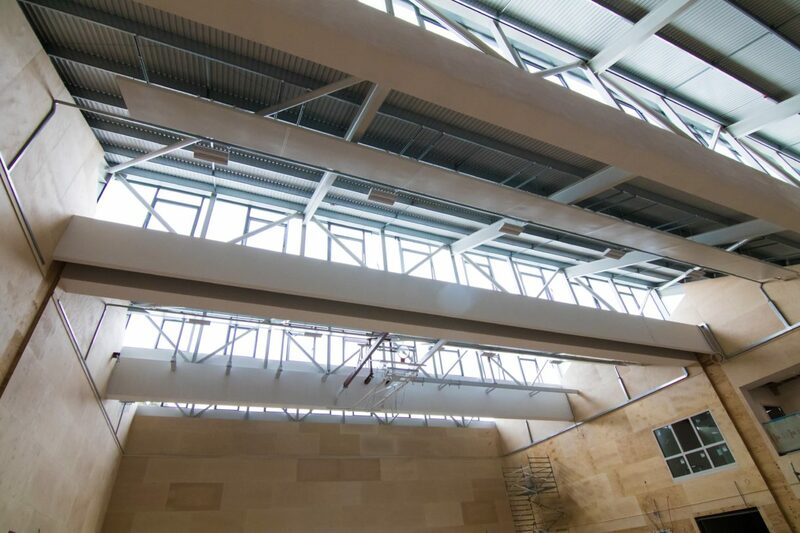 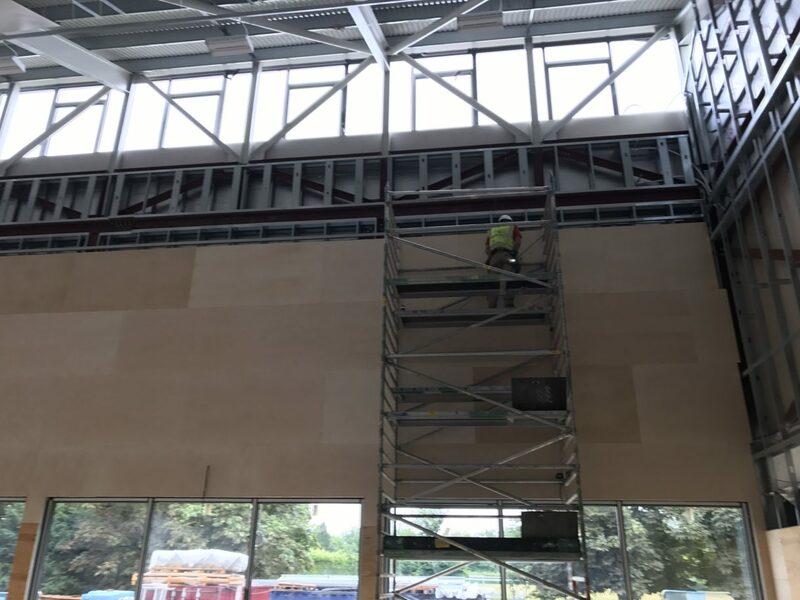 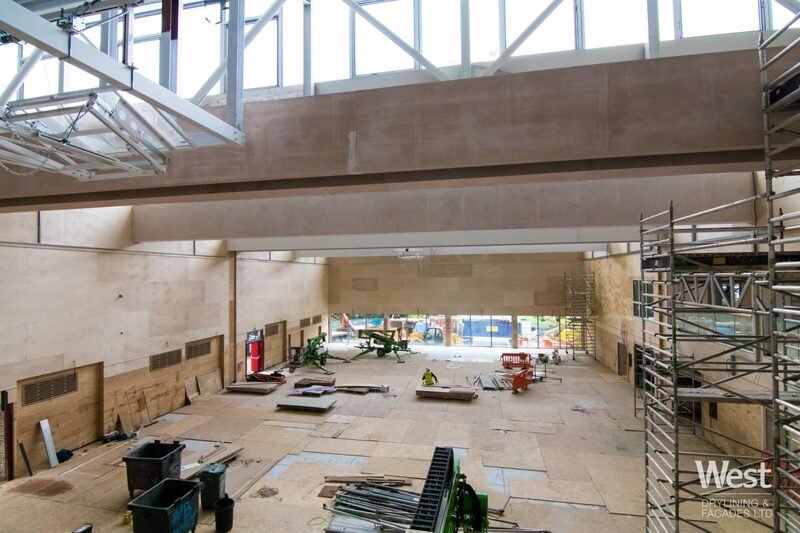 We have been on site on and off since January 2017 and were awarded the SFS package and CP board (Siniat weather defence) PIR insulation, drylining, MF ceilings, plastering, grid ceilings and acoustic baffle packages on this project. 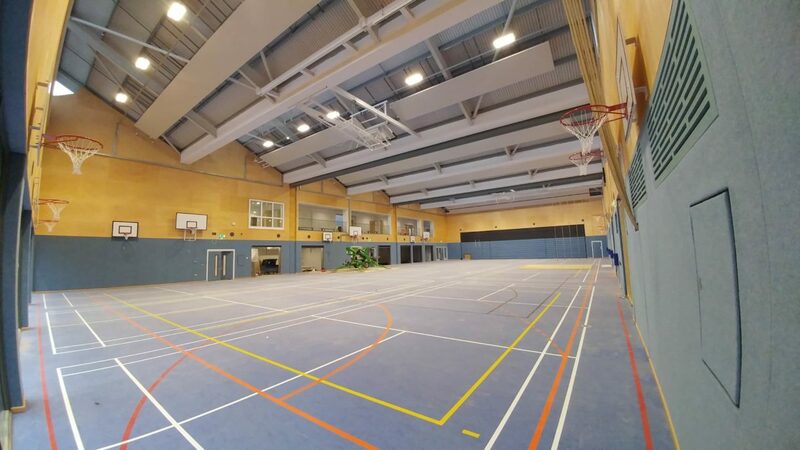 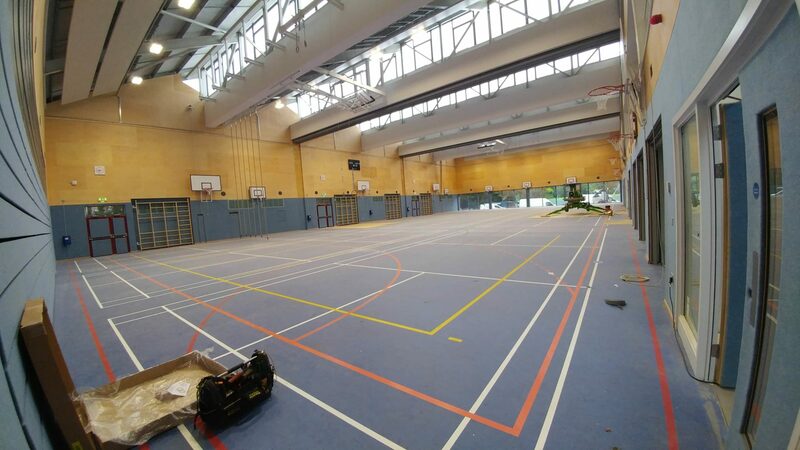 We were also given a large variation for some Birch faced ply works to the sports hall which was a little more complex than we originally anticipated with a new sprung floor installed part of the way through the ply works so a large quantity of the ply was installed from spider lifts (as you can see in the pictures) and plastered from large bridged aluminium towers. We carried out some complex bulkhead designs around some new steel members which were added in to take the weight and support the mechanism of the large horeman doors. 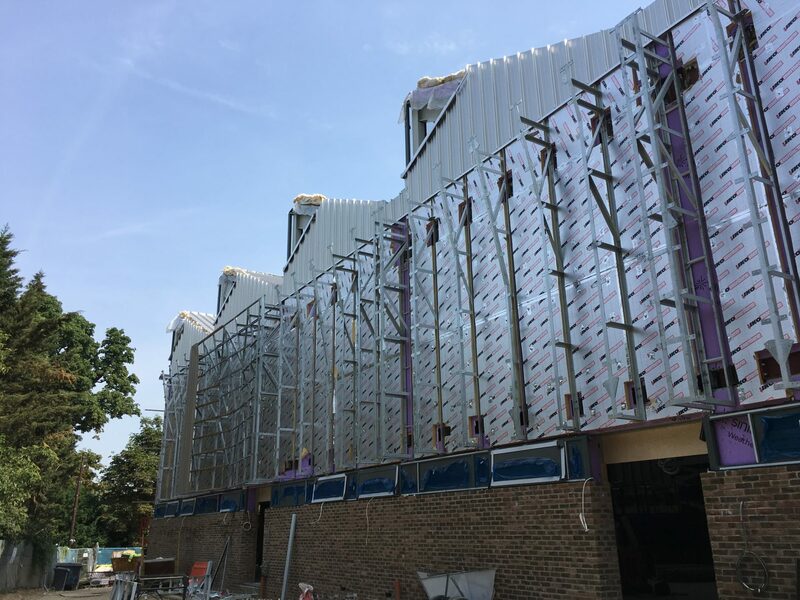 The German School has been a tricky project for all involved due to the nature of the evolving intricate design and some of the finishes and changes made to the materials and details whilst we were on site. 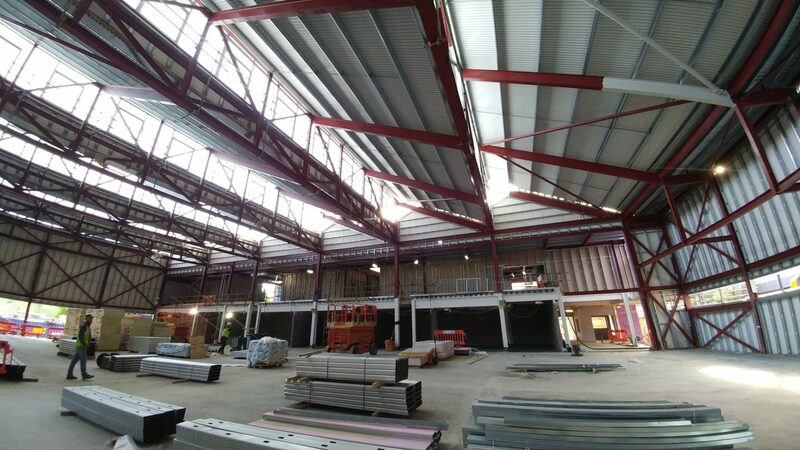 As you can see from our pictures our SFS works neilcott are now complete and look impressive from the inside and outside. 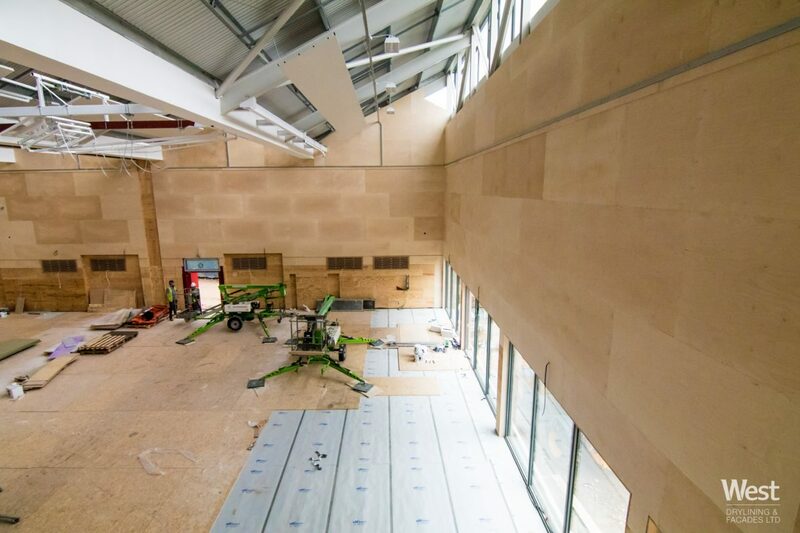 We have also completed the installation of the birch faced Ply to the sportshall, which looks really good and has now been varnished. 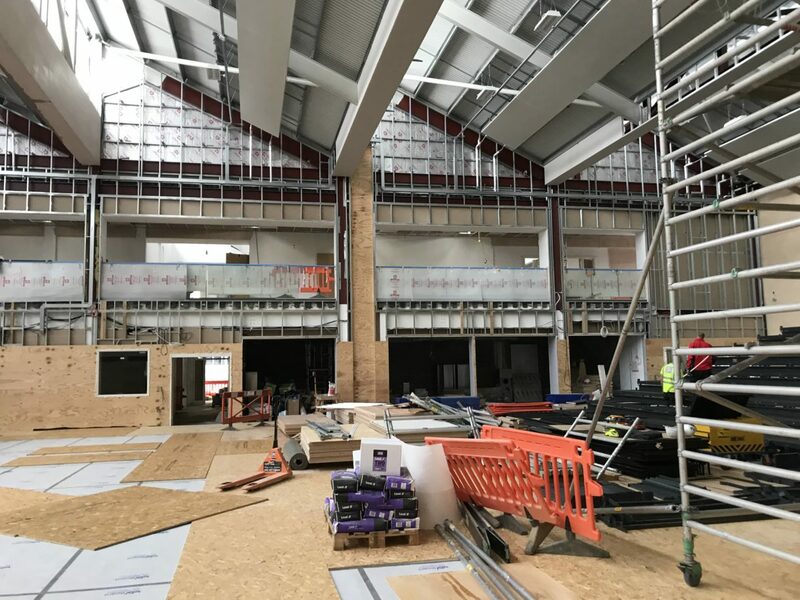 As you can see from the photos there is an unusual saw tooth roof detail and you this will be a very bright and light space when it’s compelted. 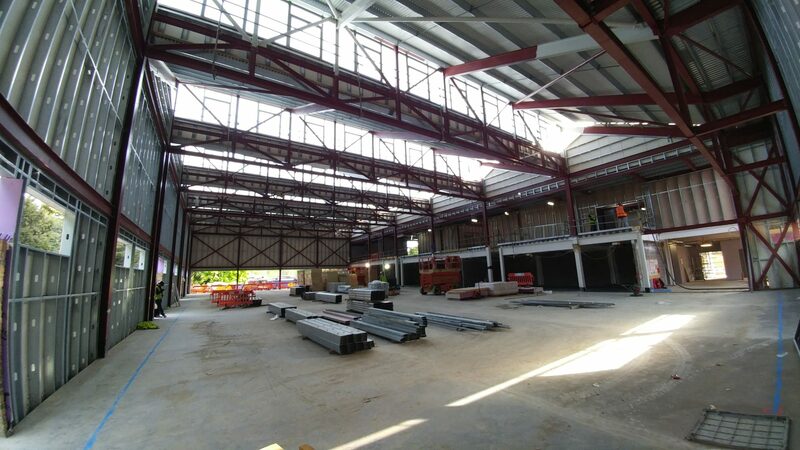 I very much look forward to posting a few more pictures of the sporthall as this will look really impressive. 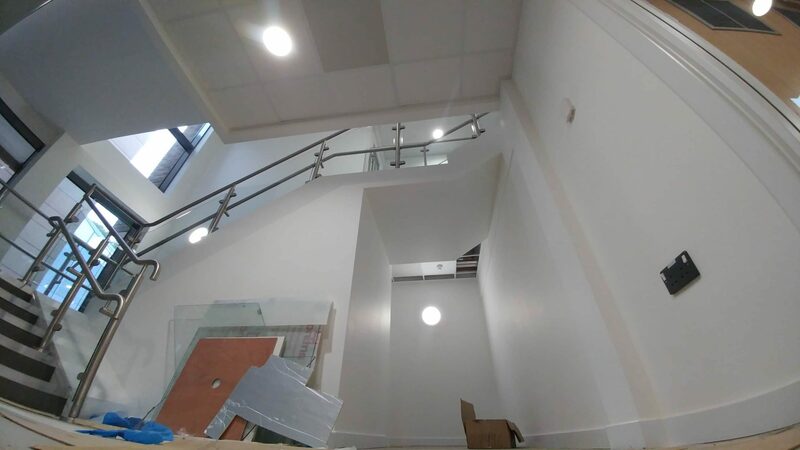 This is our second project with Neilcott and we do enjoy working with the team down there. 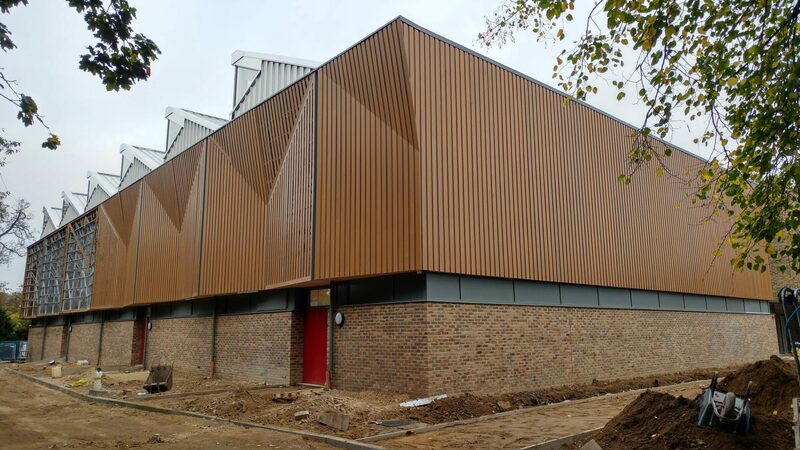 We very much look forward to working with Neilcott again on the next project! 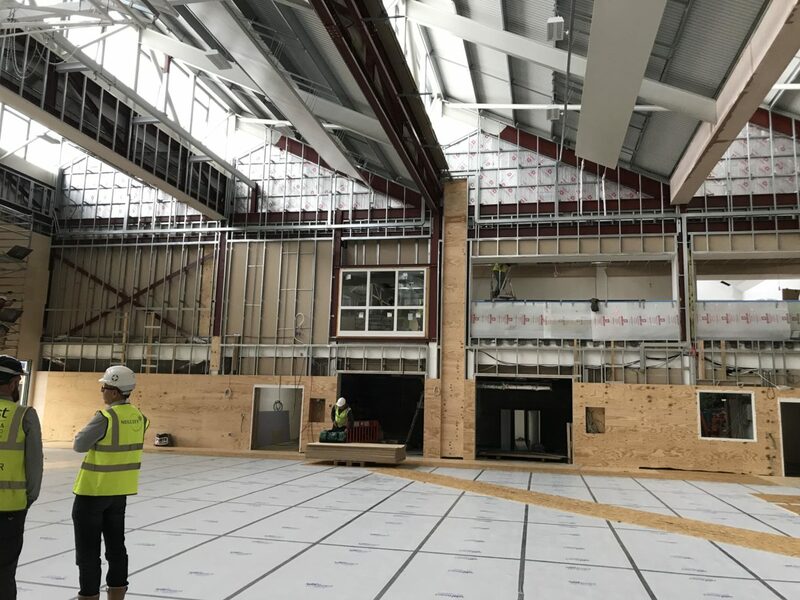 I am sure it won’t be long as we are and have been pricing a vast number of tenders with them at the moment… More information on their company can be found here.